Incredibly soft and cuddly horse themed plush cushion. 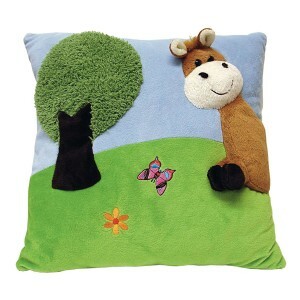 This lovely horse pillow/cushion is so incredibly soft and cuddly and would make a lovely gift for any horse mad child of any age. The soft pastel colours will suit many decors and with lots of detail for little fingers to explore, it’s sure to become a bedtime favourite. Super cute, super soft, super versatile – what more could you want?